There are many health benefits that we can get from cherry. Cherries are one of the very low calorie fruits; however, they are rich source of nutrients, vitamins, and minerals. Cherries have such a sweet flavor, they make a healthy substitute for snacks such as candy or cakes. Cherries also make an excellent ingredient for a variety of breakfast, lunch and dinner options. Cherries extensively studied its benefits in the fight against cancer. The results so far show that eating fruit is very useful in fighting organ cancers. Antioxidants in cherries may fight free radicals, or unstable molecules that can damage cells in the human body, so it is believed to slow the aging process. Research reveals that the red pigment anthocyanin in cherries help reduce inflammation and pain. Cherries are also known to lower the risk of heart disease and diabetes. The study revealed that people who consume cherries every day, have low blood cholesterol levels and lower triglycerides. Cherries are delicious and nutritious food has many essential ingredients such as: Antioxidants, Minerals, Ellagic acid, Vitamin C, Vitamin A, Bioflavonoids, Melatonin, Anthocyanins, and perillyl. Cherry fruits are very rich in stable anti-oxidant melatonin. Melatonin can cross the blood-brain barrier easily and produces soothing effects on the brain neurons, calming down nervous system irritability, which helps relieve neurosis, insomnia and headache conditions. Further, they are also good source of minerals such as potassium, iron, zinc, copper and manganese. Potassium is a heart-healthy mineral; an important component of cell and body fluids that regulate heart rate and blood pressure. One of the reasons why you should make the cherry as a favorite fruit, it is a vitamin A-containing high carotene. Two of these nutrients are needed for immunity and also beautify the skin. This fruit contains even 20 times higher than strawberries and blueberries. 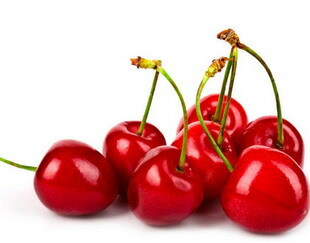 If you are experiencing frequent insomnia, cherries can do a good job to make you sleep. Melatonin makes you fast asleep. When wanting to sleep more quickly, try adding some cherries on your dinner menu. Efficacy was also perceived cherry brain. Keep you from dementia. This is because antioxidants called anthocyanins. This substance is known both as food enhancing brain power. In patients with arthritis, the fruit is highly recommended. Significant health benefits of cherries is as an anti-inflammatory. Or if you feel tired after a workout, this fruit is a snack right energy generation. Cherries also contributed as body armor from a variety of cancers. How it works is very simple. As an antioxidant that frees the body from free radical damage causes the body's cells and tissues. One more health benefits you can get from fruit cherries. Helps reduce the risk of diabetes. Anthocyanins contained in it, is believed to increase the production of insulin. Of course you also have to avoid foods with excessive sweetness. A cherry is made up of more than 75 percent water. This water content makes cherries a perfect weight loss food as foods that are high in water and low in calories keep you feeling fuller for a longer period of time than foods and drinks that are higher in calories. Cherries are also loaded with soluble fiber. This water dissolvable fiber helps accelerate weight loss and reduces your cholesterol levels by slowing its absorption into your blood.